• Bullish Tone Takes Hold. Stocks ended mostly higher Friday, with the S&P 500 extending gains into a third day, capping its best week in two months as trade tensions eased and speculation mounted that inflation will remain tame. The S&P 500 and Dow Industrials climbed higher, while the tech-heavy Nasdaq Composite snapped a five-day rally. • Weekly Advances. For the week, the S&P 500 rose 2.49%, the Dow Industrials gained 2.34%, and the Nasdaq Composite advanced 2.73%. Small cap stocks outperformed relative to the S&P 500, with the Russell 2000 Index gaining 2.65% last week. • Energy Led the Week. Energy (+4.02%), Financials (+3.62%) and Technology (+3.54%) led gainers last week, while Utilities (-2.16%) and Consumer Staples (-0.37%) lagged. Technology (+11.33%) and Energy (+7.12%) are up the most on a year-to-date (YTD) basis, followed by Consumer Discretionary (+6.76%). • Inflation Readings Remain Tame. The core consumer price index, which measures inflation without food and energy, rose less than expected last month as used car prices fell the most since 2009. The Producer Price Index also rose less than expected. • 10-Year Treasurys Reach 3%. 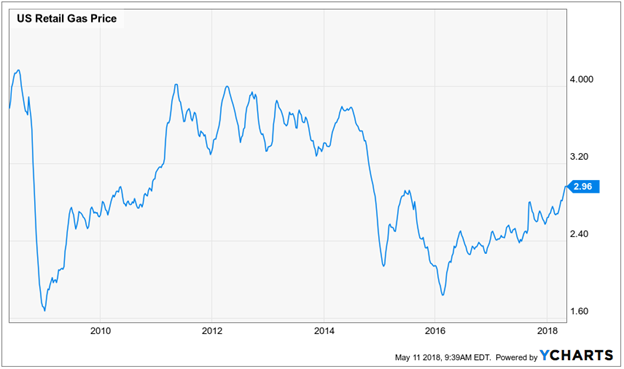 The yield on benchmark 10-year Treasury notes reached the highest level in over four years, but slipped lower after tame April consumer inflation data on Thursday created expectations for a less aggressive Fed policy stance ahead. The U.S. Dollar Index was little changed last week, while Treasury prices eased, sending the yield on 10-year notes up just two basis points to end the week at 2.971%. U.S. retail gas prices have risen sharply this year, climbing 12.3% to $2.96/gallon, nearly matching the 16.7% rise in oil prices. Over the past 12 months, retail gas prices have increased by 19.2%. There are several reasons for higher gas prices, including concerns over the USA withdrawing from the Iran Nuclear deal, OPEC supply cuts, and seasonal patterns of oil prices. More pain at the pump is expected this summer as we hit peak driving season. Historically, retail gas prices rise into the summer before cooling off in the fall and winter months. There is enough consumer strength to offset a moderate rise in retail gas prices. Consumers have a boost in purchasing power from tax reform and retail gas prices are still moderate compared to the previous decade. The average price of a gallon of gas nationally has been $2.99/gallon over the last 10 years, slightly higher than the current level. Additionally, retail gas prices have approached or exceeded $4.00/gallon multiple times during the current expansion without causing major issues for consumer spending.